UIC’s Chancellor’s Fellows Program is designed to recruit and retain highly qualified students from Illinois. Photo: Roberta Dupuis-Devlin. High achieving Illinois high school students will have the opportunity to have a free college education at the University of Illinois at Chicago under a new scholarship beginning next fall, designated the UIC Chancellor’s Fellows Program. 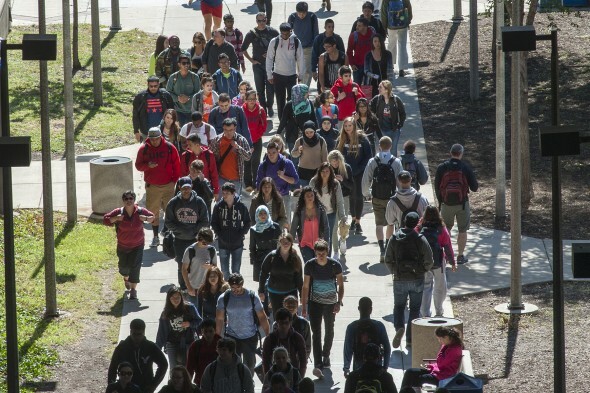 The Illinois legislature has created the AIM HIGH program and earmarked $25 million to Illinois public universities, of which $3.8 million will go to UIC beginning in the 2019-2020 school year. This statewide initiative is an effort to increase enrollment of Illinois residents at Illinois public universities. UIC will match the funds it receives from the state in order to fully fund the Chancellor’s Fellows Program. The program is open to Illinois residents who are also U.S. citizens or eligible noncitizens and who come from families with a household income no greater than six times the federal poverty rate, as indicated in the relevant AIM HIGH legislation. They must be first-time college students with a minimum unweighted high school grade point average of 3.8 and a minimum SAT score of 1360 or minimum ACT score of 30. High school valedictorians are also eligible, without reference to grade point average and standardized test scores. Students must apply to UIC by the university’s Nov. 1 early action deadline. Eligible students will also receive priority consideration for admission into the UIC Honors College.